Do you remember the last time you went out to eat? Did the hostess ask you how many were in your party, seat you accordingly, and let you know the server’s name? Did the server take your drink order and your food order to be given to the kitchen? 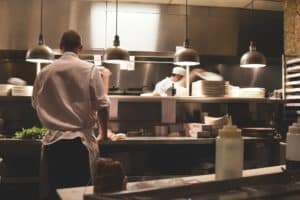 Behind the kitchen door, were you aware of the few to, potentially, many people, from the dishwasher to the chef, who made your meal possible? Imagine the inefficiencies if the chef was the one who greeted you, took your drink and food order, then prepared your meal, and brought it to your table. Crazy right? If you’re like me, you probably don’t spend a lot of time thinking about how the flow of the meal is made possible from the moment you walk in the restaurant to the moment you leave. The truth is several people make the meal possible and some of them you never see. This is a good thing. The process is often smooth and when the staff is well-trained, you get to enjoy your meal without having to think about this process. This is where the beauty lies in working with a large well-trained real estate team. Each person or group of people (much like the hostess, the server, the chef, and kitchen staff) has a specific job and they are trained to perform that job at a high level. Buyer specialists only focus on helping buyers find the perfect home. Listing specialists only focus on helping sellers sell their house. Operations staff members work to ensure that both of these experiences, buying or selling, are as close to seamless as possible. Our team of 17 amazing individuals at The Peters Company, some you’ll never meet or hear from who work behind the scenes, all play a role in creating an incredible real estate transaction experience for you. If you are looking to buy or sell a home, let us know. The Peters Company has a team ready to work for you. ← New to the Atlanta Beltline!